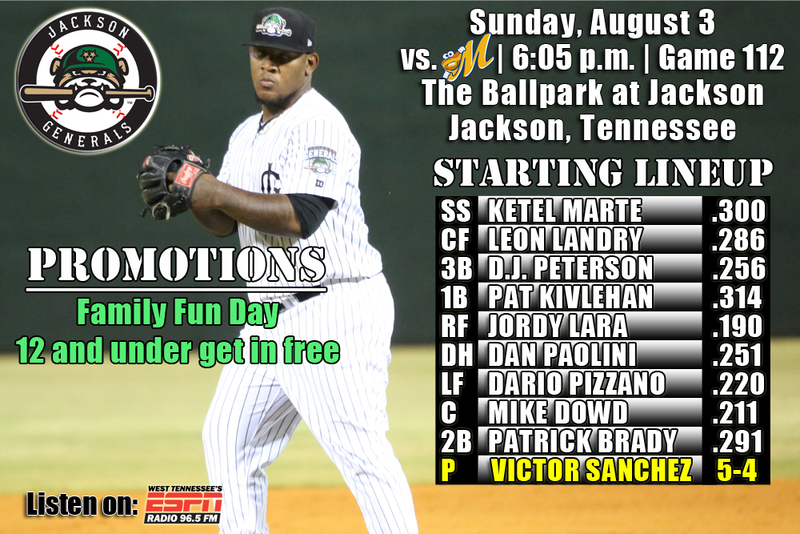 • The Generals Sunday, continue a 5-game series with Montgomery at The Ballpark at Jackson (1-2)…the Generals are 5-8 against the Biscuits this season and 3-5 in games played at Jackson…the Generals have won 3 of the last 5 series and won 4 of 5 in last homestand vs. Huntsville…dropped 4 of 5 on recent road trip to Mobile. • The Generals scored a run in the 4th and 2 more in the bottom of the 6th, but it wasn’t enough as Jackson fell to Montgomery 4-3 on Saturday. • SS Ketel Marte (2×4, R, 2B) and LF Patrick Kivlehan (2×3, RBI, BB) each recorded 2 hits, while 1B Jordy Lara (1×4, RBI) picked up the only other Generals hit. • Starter Stephen Landazuri (7.0,5,4,4,1,3,2HR) recorded the loss, allowing 4 runs on 5 hits in 7.0 innings. RH Matt Brazis (2.0,0,0,2,3) walked 2 and struck out 3 in 2.0 hitless innings to close out the game. • OF Leon Landry has hit safely in 5 of his last 6 games, batting .370 (10×27) with 6 runs scored, 2 doubles, 2 triples, 2 RBI, 2 walks and 1 stole base. Since May 16, Landry has hit safely in 54 of 63 games, batting .340 (85×250) with 42 runs scored, 17 doubles, 6 triples, 1 home run, 20 RBI, 10 walks and 18 stolen bases. During this 63-game stretch he has raised his season average from .155 to .286. • INF/OF Patrick Kivlehan currently ranks 3rd in the Southern League in batting (.314) and 3rd in slugging percentage (.511). Kivlehan also ranks 7th in the M’s organization in average (.303), T-4th in HR (17) and 2nd in RBI (89). • SS Ketel Marte currently ranks 6th in the league batting (.300), 1st in hits (125), 2nd in at-bats (417) and T-5th in doubles (26). • Bring on the Biscuits – The Generals are 5-8 this season against Montgomery and 3-5 in Jackson…the Generals are batting .269 with 7 home runs, 26 doubles, 5 triples and 65 runs scored in 13 games. • The Biscuits have a .265 batting average, with 16 homers against Jackson this season in 13 games played. • Extra Base Success – Thursday, Leon Landry collected his 6th triple of the season which was Jackson’s 40th as a team, which ranks 2nd in the league. Last season Jackson had 41 through the entire season…Jackson also ranks 3rd in the league in doubles with 201 on the season. • Landry is the toughest in the league to strikeout – OF Leon Landry is 1st in the Southern League in fewest strikeouts, fanning just once in every 9.24 at-bats. • Summer of Hitting – The Generals are leading the Southern League in batting since June 1st, batting .278 (511/1,838) with 31 home runs, 105 doubles and 25 triples in 55 games. • INF Patrick Kivlehan has hit safely in 14 of his last 17 games, batting .355 (22×62) with 10 runs scored, 6 doubles, 3 triples, 2 home runs, 14 RBI and 10 walks. He also has hit safely in 19 of his last 23 games (since 7/8), batting .366 (30×82) with 16 runs scored, 7 doubles, 4 triples, 3 home runs, 19 RBI and 12 walks.